So you're thinking about getting a brand new frameless glass shower door. But what goes into keeping a glass shower door clean so that their beauty will continue to shine for years? You have many options when it comes to keeping your glass shower doors clean. Here are a few pointers from the glass experts. Why Do You Have To Clean Your Glass Shower Doors? At first glance, your glass shower doors appear to have an impermeable surface. But glass is actually quite porous. This porosity allows water to seep into the pores of the glass causing corrosion over time. In order to protect and preserve your glass showers doors’ original shine and beauty, you must take steps to clean and maintain them. Cleaning shower glass that has been treated with ClearShield is easy, and can be accomplished in two easy steps: squeegee dry your shower after use and then clean with ClearShield Aftercare product every two to three weeks. That's it. With your glass shower doors treated with ClearShield Glass Protector you will clean your shower 50% less than an untreated glass shower. There will be no water, lime-scale, soap scum or dirt stains as ClearShield Glass Protector repels them all. ClearShield Glass Protector has a 10 year limited warranty. Dulles Glass is the only authorized ClearShield Glass Protector dealer in the Greater Washington DC metropolitan area. ClearShield Glass Protector is one of the only ways to preserve, clean and protect the original shine of your glass shower doors long-term. If you don't opt for the ClearShield Glass Protector, you will need to clean your showers more often -- about 50% more often! 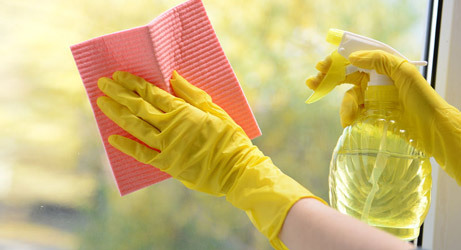 Natural remedies and commercial cleaners both work for this job, so stock up. Economical and eco-friendly glass cleaner. Mix one part white vinegar and two parts water and put into a spray bottle. Use lint-free paper towels or newspaper to avoid streaks. You must clean after every shower to maintain your glass showers doors' shine. While this method is convenient, its success depends on being constantly vigilant against water, soup scum and hard water stains. The majority of commercial glass cleaners contain ammonia and isopropanol. May be more powerful than vinegar and water. You must clean after every shower to maintain your glass showers’ door shine. Persistent diligence is still required in order for you to be triumphant in your battle against a dulled shine and corrosion. Make sure to clean your glass using circular overlapping motions and then rinse with clear water. Squeegee excess water off using overlapping vertical motions. All of these methods will clean your glass shower doors, but the best way is to have your glass shower doors treated with ClearShield Glass Protector.